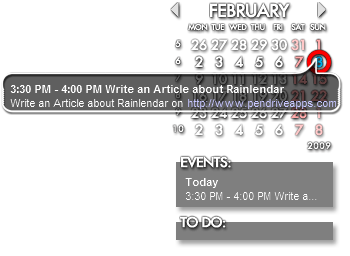 Rainlendar is a Free Portable Calendar, portable task and event or appointment manager. It can be used to organize your daily tasks, events, notes or appointments and can be set to remind you of those tasks or events. Rainlendar utilizes a standard iCalendar format to store tasks, making it simple to transfer tasks between applications. The Calendar is also skinnable so the appearance can be customized.